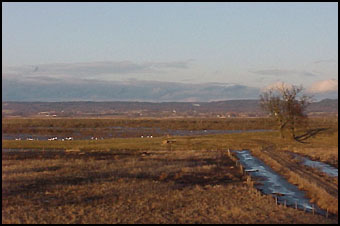 The southernmost part of Lake Hornborga reaches road 184 between Falköping and Skara. This part of the lake has not been restored to the same extent as the northern part. It is still much overgrown with reed, grass and willow except of the part adjoining the road where trees and bushes have been removed and where experiments are being made to keep the country open by letting animales graze there. South of the Church of Bjurum, Bjurumsån (the name of the small river) debouches into the lake. Near the river ice-free water attracts birds that arrive in early spring, like ducks, swans and geese. At road 184 between Skara and Falköping close to the Church of Bjurum, about one kilometre of the old main road has been saved and forms a by-road connected with the new road at both ends. There are also two other connecting roads. Check carefully if there are one-way roads. In the crane season there are several signs telling you how to find your way, and throughout the year there is a sign marked "Rastplats Trandansen". The main attraction is of course the thousands of cranes that stay here for a few weeks at the end of March and April every year. Since the beginning of the fifties there has been a yearly invasion of people interested in cranes. But even in winter this area has a lot to offer to those who are interested in birds. In connection with Lake Hornborga, Falbygden´s Birdwatchers´ Club runs a feeding station for eagles, so there are good chances of seeing golden eagles, white-tailed eagles, goshawks, rough-legged buzzards and above all ravens from the hill at "Trandansen". From there you can also see wintering great grey shrikes. When winter ends and the feeding of the eagles ceases in February-March, Bjurumsån (the small lake) floods the surroundings of Vadboden, and open water makes early water birds gather here. In March you can find whooper swans, greylag geese, Canada geese, and different kind of ducks here. In the middle of March the first cranes arrive, and some weeks later there are thousands of them. 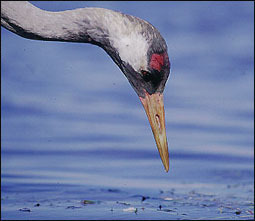 There may be up to 10 000 cranes around Lake Hornborga in a single day during this period. Thousands of people interested in cranes visit the area every day admiring the big birds that can be seen at close range. If you are interested in the life and behaviour of birds, you have excellent possibilities of studying the cranes from the hill at "Trandansen". Early in the morning, with the rising sun in the background, the cranes come flying from their resting place in Lake Hornborga to land at Vadboden. There they will find barley which has been spread on the ground on the previous evening after they left for their night-quarters. If you have been standing here for a while watching the cranes, you will find that what you see is not just a flock of birds but isolated pairs that defend their range, their space and their feeding place. Something happens all the time. You can see both courtship and mating. If the wather is suitable for taking flight, you should, towards the middle of the afternoon, start looking for cranes coming from the south. They can bee seen at a long distance off and high up in the air before they land at Vadboden seemingly as if by means of a parachute. Towards the evening the activity of the cranes is the most intense. At sunset the birds leave for their night-quarters. It is a grand spectacle if 3000 to 4000 cranes take off almost at the same time. At the end of April the massive invasion of cranes and tourists is over. After the crane season there are birds to watch in the area as well. You can now watch for instance mallards, shovelers, wigeons, lapwings, greenshanks, wood sandpipers and redshanks. The most common bird of prey is the marsh harrier that is always to be seen over the lake in the summer. In this area there are restrictions concerning where to move from the late winter to the summer. Notice the restrictions! You can move freely on the hill at "Trandansen" as well as on the road and in the indicated parking places. Throughout the 20th century cranes have stayed for a while near the estates of Bjurum and Dagsnäs, especially because of extensive potato-growing. In spring the cranes ate the potatoes that had been left in the fields the previous autumn. When potatoes where not grown any more, it turned out that barley was the best crop to grow instead. The barley was appreciated by the cranes, and it was easy to spread it out. When the cranes are there in the largest numbers, about two tons of barley are distributed every evening.